The invitation Apple sent to journalists, for an iPad-related event in San Francisco. 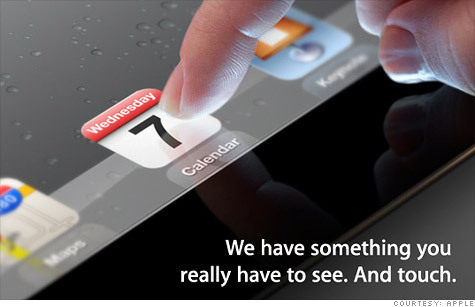 NEW YORK (CNNMoney) -- Apple is expected to announce the iPad 3 at a "special event" in California next week. The invitation (pictured above) included a photo of someone using an iPad, with a single line: "We have something you really have to see. And touch." If the March 7 event does bring the third iteration of Apple's (AAPL, Fortune 500) popular tablet, it will come nearly one year after the announcement of the iPad 2. It's unclear what changes the iPad 3 will bring -- though rumors abound, as they always do with a new Apple device. There is speculation that the iPad 3 may come with a stronger, bigger battery -- making the new tablet thicker than the previous version. Another oft-cited rumor is retina display: a high-pixel-count screen that's already available on the iPhone 4S. The iPad has largely dominated the tablet market, as sales of other devices -- including the Research in Motion (RIMM) BlackBerry Playbook, the Samsung Galaxy Tab and Motorola Mobility's (MMI) Xoom -- have disappointed. By comparison, Apple sold a record 15.4 million iPads in its latest quarter -- more than double the amount sold over the same quarter in 2011. Those strong tablet sales helped push Apple to record quarterly revenue of $46.3 billion and record profit of $13.1 billion.